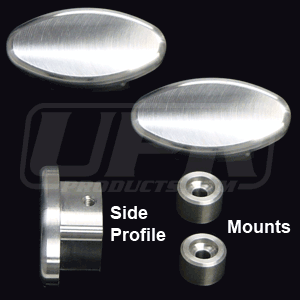 New design gives your back seat a completely new look with a set of UPR's Billet Coat Hangers. Our Billet Clothes Hangers are a direct replacement for your existing stock hangers. Crafted to replace the oem pieces and lock into place with set screws as well as the later models with the break off inserts. 1979 1980 1981 1982 1983 1984 1985 1986 1987 1988 1989 1990 1991 1992 1993 1994 1995 1996 1997 1998 1999 2000 2001 2002 2003 2004 2005 2006 2007 2008 2009 GT GTS Mustang Cobra Bullitt Shelby Roush Saleen & Steeda Vehicles. 1999 2000 2001 2002 2003 2004 Superduty F250 F-250 F350 F-350 F450 F-450 2004 2005 2006 F-Series F150 F-150 No one else can stack up to the bold clean styling of our aftermarket Billet dress ups, Street Strip & Racing Suspension & Performance Parts for your late model American Muscle Car!